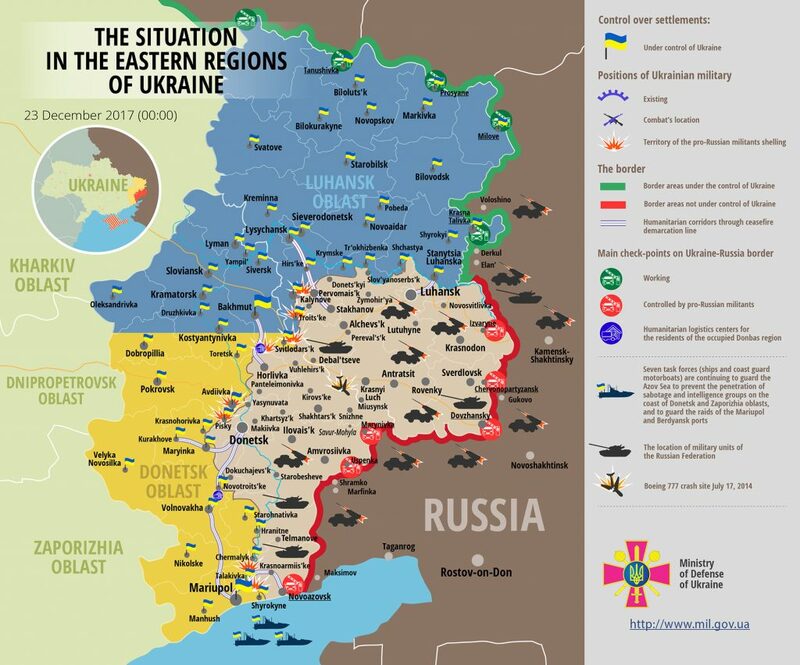 Russia-backed militants delivered 22 precision attacks against Ukrainian troops in eastern Ukraine yesterday, using, among other weapons, large-caliber artillery, tanks, mortars, and IFV mounted weapons. Ukrainian troops returned fire 12 times using weapons not proscribed under the Minsk agreements, reported Colonel Oleksandr Motuzyanyk, Ukrainian Ministry of Defense spokesman on ATO, at a press briefing at Ukraine Crisis Media Center. In Donetsk sector, Russia-backed militants violated the ceasefire 14 times. “Throughout the night, and until 8:00 the enemy delivered attacks against Ukrainian positions in Pisky area, having fired 20 rounds from a tank and almost sixty 120-mm mortar rounds”, Colonel Motuzyanyk said. In the morning, Ukrainian positions near Lebedynske and Vodiane came under the hostile fire of 120-mm mortars. In addition, militants fired 25 more mortar rounds there in the afternoon. In Avdiivka area, Russia-backed militants delivered intense fire using small arms and light weapons during the day, and employing 120-mm and 82-mm mortars in the evening. Russian proxies used mortars of the same calibers in Pishchevyck and Pavlopil areas as well. In Luhansk sector, Russia-backed militants delivered eight precision attacks against Ukrainian positions. In the morning, the enemy was active in Zaitseve area for almost an hour using a tank, 120-mm mortars and IFVs. Later in the afternoon militants resumed using the same weapons. In the evening, Ukrainian positions in Luhanske and Travneve areas came under the fire of 120-mm mortars, IFVs, small arms and light weapons. “Starting 21.00 and almost till midnight, the enemy made an extensive use of large-caliber mortars, 122-mm artillery systems, IFVs, and grenade launchers in Novoaleksandrivka, Stary Aidar, and Troitske areas”, Colonel Motuzyanyk elaborated. Ukrainian troops returned fire using small arms and light weapons. Unfortunately, one Ukrainian serviceman was killed in action yesterday during a hostile artillery shelling near Stary Aidar. Two more troops were wounded in action: one near Zaitseve and one near Avdiivka. Ministry of Defense spokesman on ATO noted that Ukrainian side of the Joint Control and Coordination Center (JCCC) informed that in connection with Christmas and New Year’s holidays, the Trilateral Contact Group in Minsk made a decision during its recent session to establish a comprehensive, sustainable, and indefinite ceasefire starting midnight of December 23, 2017.